Nottingham Trent University's "Heart of the Campus" development at Clifton has won another prestigious award. The ambitious project was awarded the Judges' Special Award at the East Midlands Property Dinner, which celebrates the very best in construction, property and design across the region. 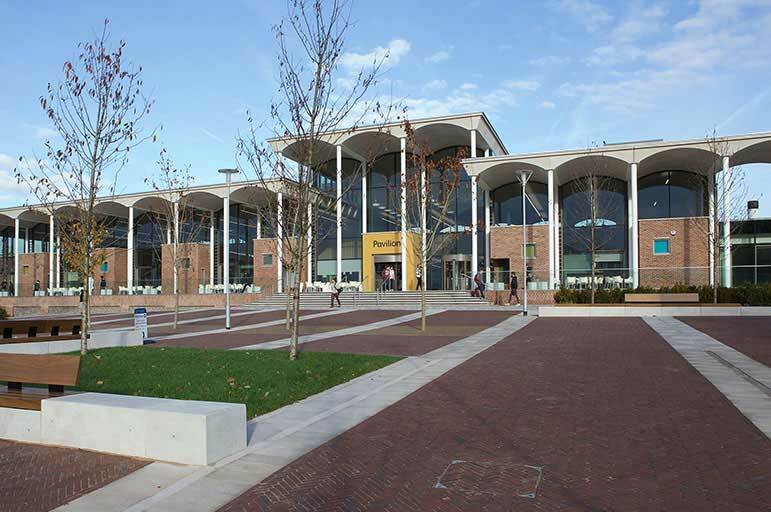 Constructed by G F Tomlinson, the development was recognised for transforming the University's Clifton Campus into a vibrant and cohesive environment for students to learn and be inspired. The project successfully delivered two stunning buildings – a new bespoke Pavilion, and the separate Teaching and Learning Building – around a central landscaped plaza. The Pavilion provides students with two levels of social study space, a coffee shop and a communal area, while the Teaching and Learning Building offers a flexible learning environment for 800 students in three lecture theatres, eight teaching rooms, and two seminar rooms. Both buildings achieved a BREEAM Excellent rating and the Pavilion is the University's first building to achieve carbon neutral standards. Ged O'Donoghue, Director of Estates and Resources at Nottingham Trent University, said: "The brief was to deliver buildings that inspired students to want to learn in them, and we are delighted that the student feedback is that the team succeeded. It is the most successful job I've ever been involved with." Andy Sewards, managing director at G F Tomlinson, said: "We are honoured to have won this prestigious award in recognition of the success of this development. "This project has exceeded all expectations not only in its design, construction and sustainability, but also because of the enhanced working and learning environment. "With its timeless design, high-quality finish and energy efficient performance, both buildings will inspire students and staff for generations to come. It was a pleasure to work with the University and all the partners involved to deliver such a rewarding project." The Judges' Special Award is the latest accolade in a long list of awards which the Heart of the Campus team have collected for this landmark development. Previous recognitions include the Royal Institute of British Architects (RIBA) East Midlands Awards (Client of the Year Award), Royal Institution of Chartered Surveyors (RICS) East Midlands (Regeneration Award), East Midlands Celebrating Construction Awards (Integration and Collaborative Working Award), and the Considerate Constructors Scheme National Award. The architect for this scheme was Evans Vettori Architects, supported by Pulse Associates Ltd as quantity surveyors. * or Sarah Howells at Cartwright Communications on +44 (0)115 853 2110. * Nottingham Trent University's five-year strategic plan Creating the University of the Future has five main ambitions: Creating Opportunity, Valuing Ideas, Enriching Society, Connecting Globally, and Empowering People.